Technology: Chemical Machining, or Chemical Milling, Services are manufacturing services which use uses etchants to remove layers of metal from forged or cast parts typically with the goal of reducing weight. Parts are generally immersed in an etchant bath to which unmasked portions of the part are exposed. Variations of the process exist, such as spray chemical milling. Very large pieces, such as the sections of an aircraft, can be machined using the technique of chemical milling. The technique has equal application in machining small, intricate metal parts from thin sheets that are then bent to form complex 3D shapes. 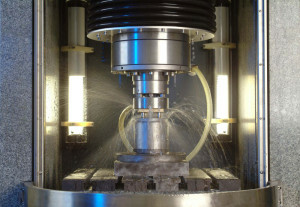 The two primary forms of chemical machining are ECM, or electrochemical machining and PCM, or photochemical machining. ECM is primarily associated with large aircraft components such as turbine blades. PCM is the predominant techniques for producing small thin parts.Chemical machining is an alternative to waterjet and laser cutting, wire EDM, stamping, and punching. Advantages: Chemical machining services has economical advantages over other cutting methods when it comes to intricate parts manufacturing. Applications: Chemical machining services are used to produce a variety of thin, often small, mechanical parts.